The Communist Party of China (CPC), also known as the Chinese Communist Party (CCP), is the founding and the ruling political party of the People's Republic of China (PRC). It is the world's largest political party. While not a governing body recognized by the PRC's constitution, the CPC's position as the supreme political authority and power in the PRC is realized through its control of all state apparatuses and of the legislative process. 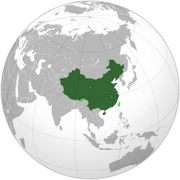 The Communist Party of China was founded in May 1921 in Shanghai, and came to rule all of mainland China in 1949 after defeating its rival the Kuomintang (KMT) in the Chinese Civil War. The CPC claimed 75.93 million members on 9 October 2009 which constitutes 5.6% of the total population of mainland China. The Nanchang Uprising (simplified Chinese: 南昌起义; traditional Chinese: 南昌起義; pinyin: Nánchāng Qǐyì) (August 1, 1927) was the first major Kuomintang-Communist engagement of the Chinese Civil War, in order to counter the anti-communist purges by the Nationalist Party of China. The Kuomintang (KMT, or Nationalist Party) established a ‘Revolutionary Committee’ at Nanchang to plan the spark that was expected to ignite a wide-spread peasant uprising. Deng Yanda, Soong Qingling (Soong Ching-ling, Madame Sun Yat-sen) and Zhang Fakui (who later crushed the uprising) were among the political leaders. Military forces in Nanchang rebelled under the leadership of He Long and Zhou Enlai attempting to seize control of the city after the end of the first Kuomintang-Communist alliance. Other important leaders in this event were Zhu De, Ye Ting, and Liu Bocheng. Communist forces successfully occupied Nanchang and escaped from the siege of Kuomintang forces by August 5, withdrawing to the Jinggang Mountains of western Jiangxi. The day of August 1 was later regarded as the anniversary of the founding of the People's Liberation Army. It is regarded as the first action fought against the Kuomintang. The National Day of the People's Republic of China (simplified Chinese: 国庆节; traditional Chinese: 國慶節; pinyin: guóqìng jié) is celebrated every year on October 1. It is a public holiday in the People's Republic of China to celebrate its national day. The PRC was founded on October 1, 1949 with a ceremony at Tiananmen Square. The Central People's Government passed the Resolution on the National Day of the People's Republic of China on December 2, 1949 and declared that October 1 is the National Day. The National Day marks the start of one of the two Golden Weeks in the PRC. However, there have been some recent controversies over whether Golden Weeks should be kept. The National Day is celebrated throughout mainland China, Hong Kong, and Macau with a variety of government-organised festivities, including fireworks and concerts. Public places, such as Tiananmen Square in Beijing, are decorated in a festive theme. Portraits of revered leaders, such as Sun Yat-sen, are publicly displayed.